วันอังคารที่ 03 กุมภาพันธ์ 2015 เวลา 09:12 น.
Thailand is the mecca of Theravada Buddhism, a strand of Buddhism that elevates the status of Buddhist monks and teaches self-liberation through personal effort. 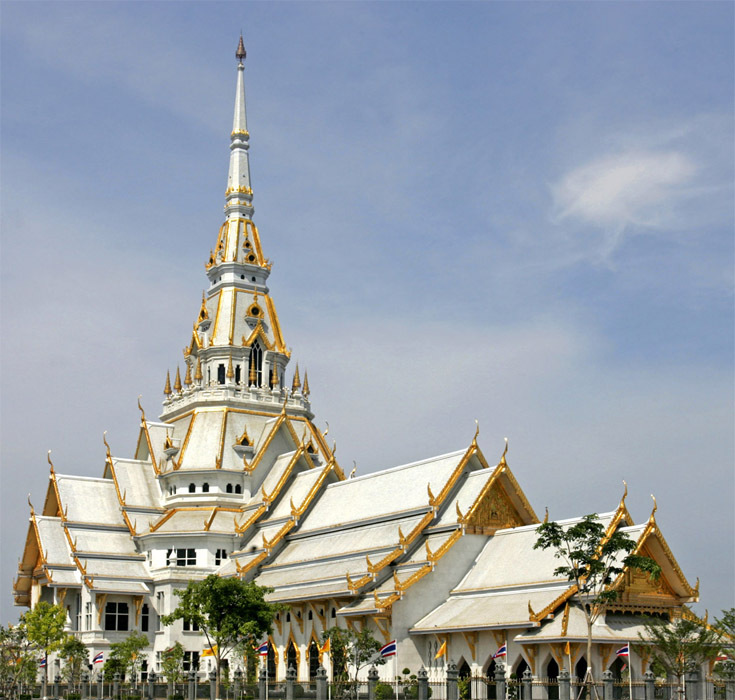 Theravada is the oldest and most traditional of all. It is often says that Theravada Buddhism is written exactly as what Lord Buddha had taught. 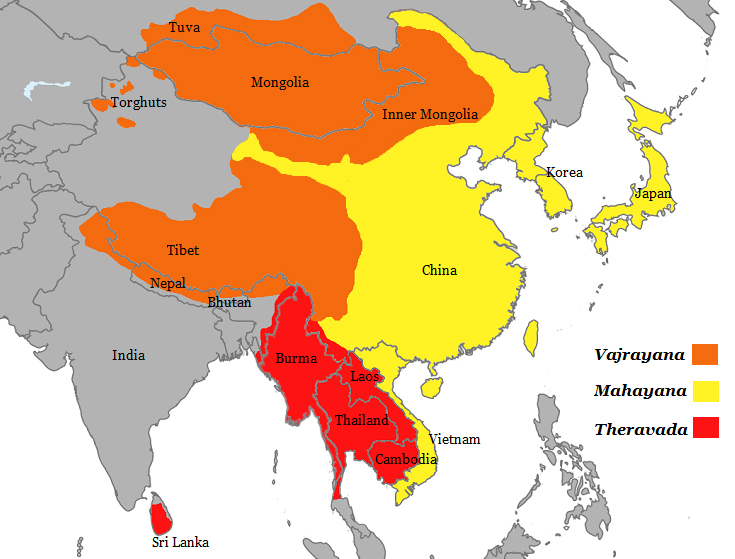 At present Theravada Buddhism predominantly exist in Sri Lanka and most of continental Southeast Asia (Cambodia, Laos, Myanmar, Thailand). Anyone who wants to learn, explore and practise this traditional invaluable philosophy is encouraged to visit one of these countries and search for a meditational retreat. 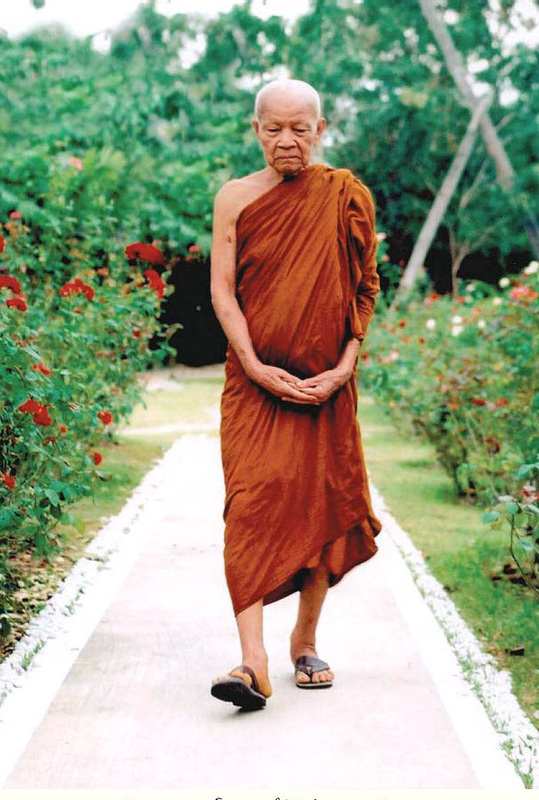 The life of an ordinary Thai monk appears incredibly extraordinary to a secular person because of the amount of focus and self-discipline it demands for following regular monk duties, not to mention the duties of higher level monks. When we visit a Thai temple we get a sense of a monk’s spiritual journey, like learning about the times of day they recite prayers, the kind of activities they are involved in, how many hours they meditate, and when is the best time to make an offering. 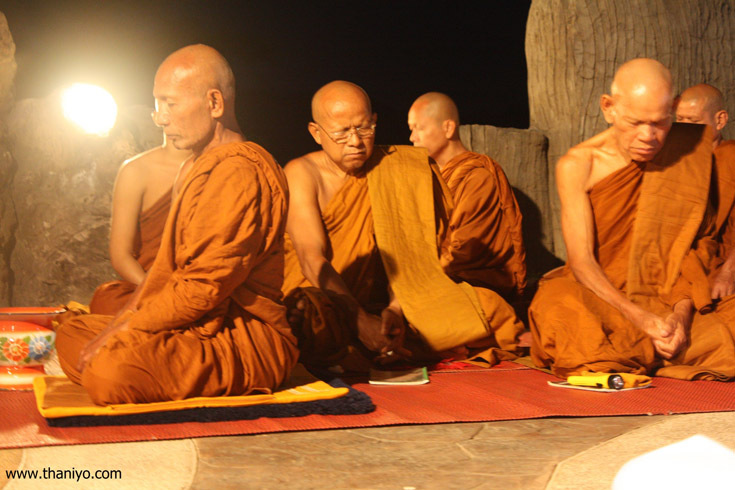 The Sangha World in Thailand consists of about 200,000 monks and 85,000 novices at most times of the year. However, these numbers increase during the "Buddhist lent" to 300,000 and 100,000 novices. Young boys may become novices at any age, but a man cannot become a monk until he reaches the age of twenty. He can then remain a monk for as long as he wishes, even for just one day. Three months is more usual, although some choose to remain in monkhood for the rest of their lives. There are over 33,000 temples in Thailand and the daily routine of the monks in all of them is pretty much the same. 9.00 am - Studying Buddha Dhamma and the disciplinary rules of the monastic order. In walking meditation we use the experience of walking as our focus. We become mindful of our experience while walking, and try to keep our awareness involved with the experience of walking. 3.00 pm - Everyday monks take care of the temple compound, clean the monk's house, clean the inside of the buildings, clean the bathroom, water the flowers, sweep the floor. 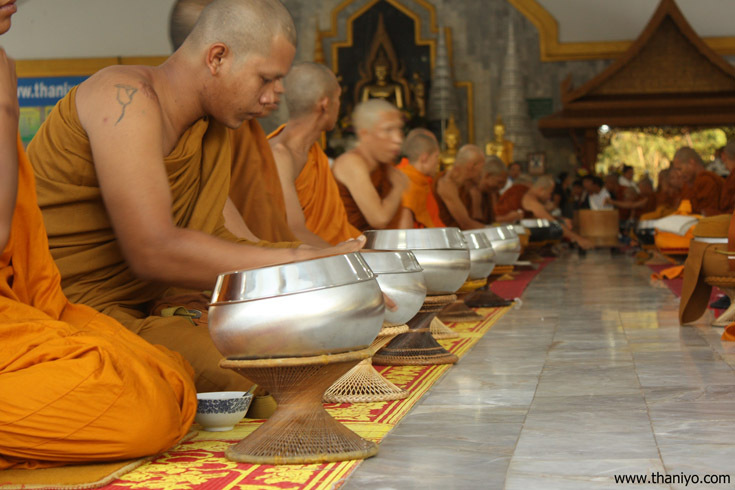 As sweeping is a repetitive movement, some temples even teach their monks to meditate while doing this task. Time remaining is to prepare bathing for the Evening Chant. 6.00 pm - A two-hour session of meditation and prayer begins. 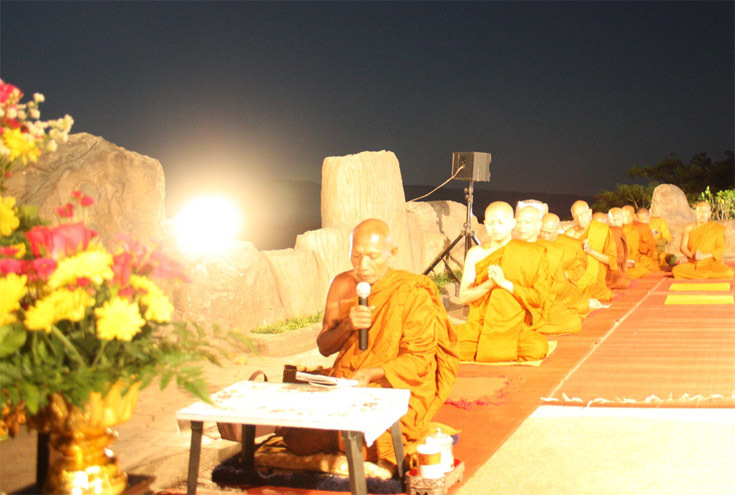 ( Evening Chant ) Sometimes the abbot or a senior monk will give a Dhamma talk to his disciples and visitors. 8.00 pm - The monks retire to do homework, take a rest and sleep. Sometimes monks are invited by lay people to perform funeral rites. • The people rely upon monks to chant the sutras that will benefit the deceased, and to conduct all funeral rites and memorial services. To conduct the rites for the dead may be considered the one indispensable service rendered the community by the monks. For this reason the crematory in each large temple has no rival in secular society. • After death a bathing ceremony takes place in which relatives and friends pour water over one hand of the deceased. The body is then placed in a coffin and surrounded with wreaths, candles and sticks of incense. If possible a photograph of the deceased is placed alongside, and coloured lights are suspended about the coffin: Sometimes the cremation is deferred for a week to allow distant relatives to attend or to show special honour to the dead. In this case a chapter of monks comes to the house one or more times each day to chant from the Abhidharma, sometimes holding the bhusa yong, a broad ribbon, attached to the coffin. 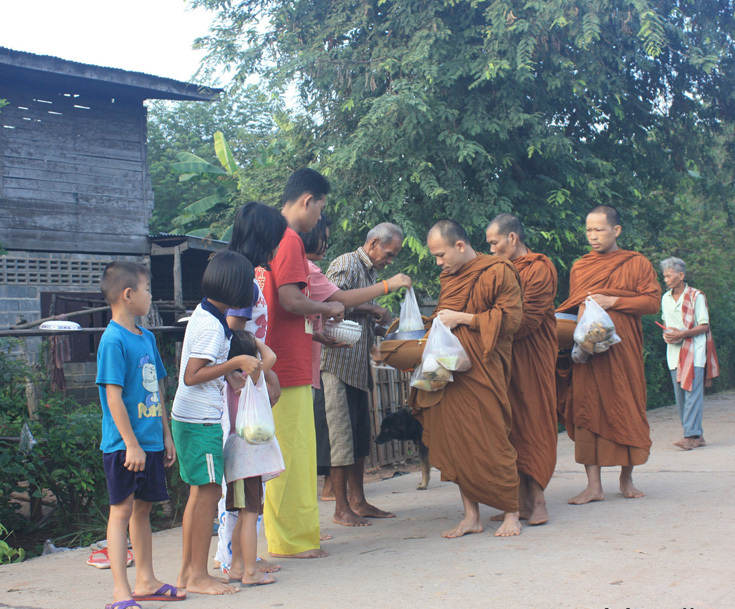 Food is offered to the officiating monks as part of the merit-making for the deceased. 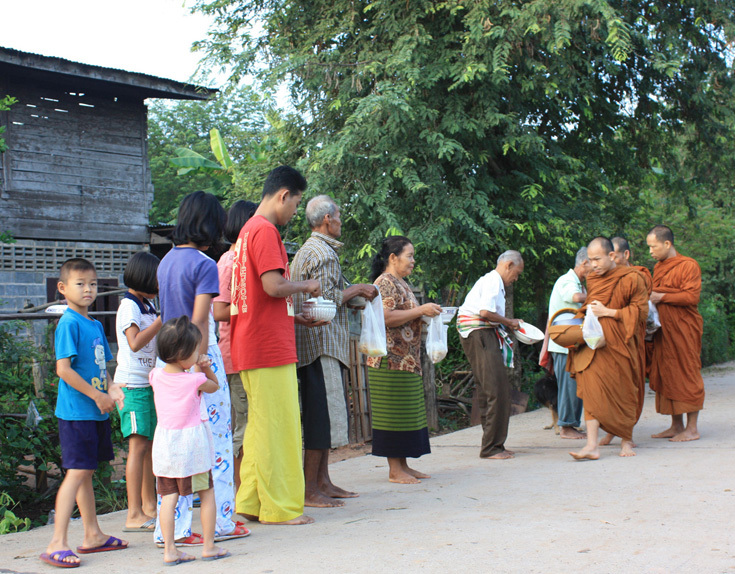 Sometimes monks are invited by lay people to bless a house. Perform a house blessing. In Buddhism, a ceremony known as Khuan Ban Mai is performed (in certain regions) when a new house is built to protect the house and its inhabitants. The ceremony is performed by a group of nine monks, who must be invited to the house early on the morning of the ceremony. • The monks then perform a ritual involving sacred lustral water and wax candles. As the wax melts and drops into the water, it is believed to wash away evil and sorrow. • The monks also chant prayers in the Pali language, while passing a white string through each of their hands. The vibrations from the chanted prayers are believed to pass through the string, protecting the houses and its inhabitants. • After the ceremony, the monks sit down to a meal prepared by the host family and their friends and neighbors.They must finished their meal before noon. Then one monk sprinkles holy water in each of the rooms of the house, before they all leave. 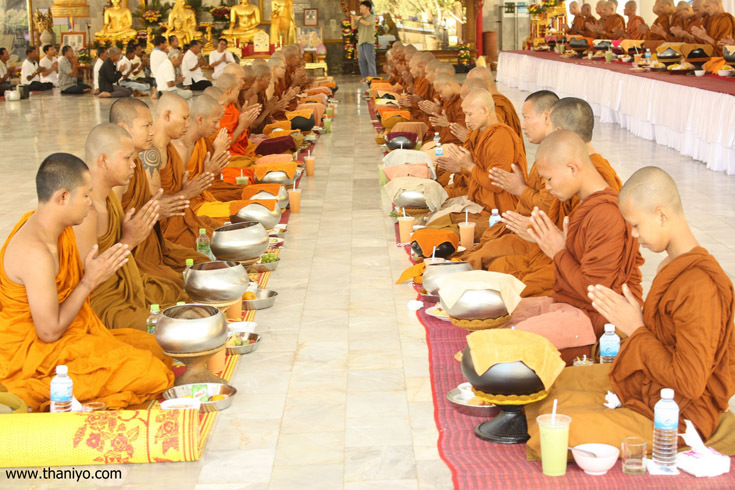 • Once the monks leave, the rest of the guests sit down to eat the remaining food. In the afternoon, they perform the thread ceremony, where the guests wrap a white thread around the homeowners and offer them their blessing. Sometimes monks are invited by lay people to perform a buddhist wedding ritual. Perform the Buddhist blessing: The Buddhist blessing is the most vital part to a Buddhist wedding. • The blessing takes place in the shrine room of the temple or the house of a groom and lasts about half an hour. During this time Buddhist monks chant from sacred texts in the pali language (old Indian language). • The guests and the wedding couple observe but do not participate therefore no service sheets are handed out. There is no choir apart from the monks themselves and photos and videos of the ceremony are allowed. Chant : In Buddhism, chanting is the traditional means of preparing the mind for meditation, especially as part of formal practice (in either a lay or monastic context). Some forms of Buddhism also use chanting for ritualistic purposes. Dhamma : Event; phenomenon; the way things are in and of themselves; their inherent qualities; the basic principles underlying their behavior. Also, principles of behavior that human beings ought to follow so as to fit in with the right natural order of things; qualities of mind they should develop so as to realize the inherent quality of the mind in and of itself. By extension, 'Dhamma' is used also to denote any doctrine that teaches such things. Thus the Dhamma of the Buddha denotes both his teachings and the direct experience of nibbana, the quality at which those teachings are aimed. Sangha :The community of the Buddha's disciples. On the conventional level, this refers to the Buddhist monkhood. On the ideal level, it refers to those of the Buddha's followers, whether lay or ordained, who have attained at least the first of the transcendent paths culminating in nibbana. or not this submit is written by him as no one else realize such specified about my difficulty. interest the viewers to visit the web page, that's what this web page is providing. It's an awesome article designed for all the web users; they will take advantage from it I am sure.